In the year 2035, a biological research project to create an Artificial and Intelligent Cellular Organism (A.I.C.O.) went awry, resulting in an incident called the “Burst” which transformed Kurobe Gorge into a quarantine area infested by a rampant growth of synthetic organisms called Matter. 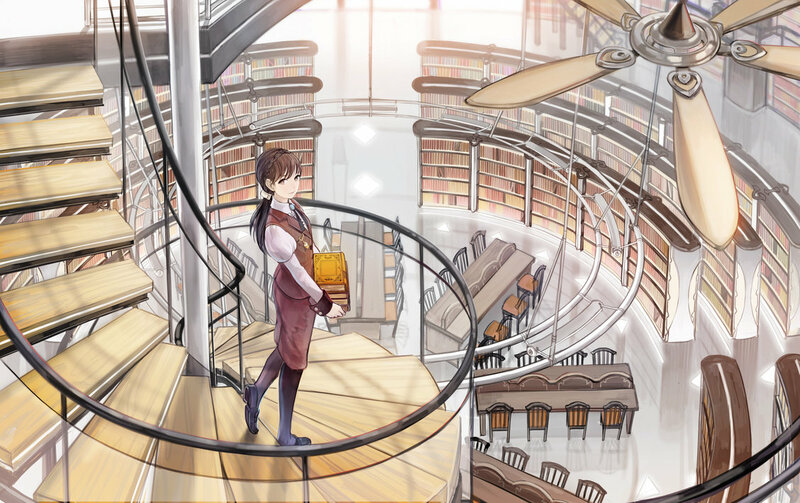 Two years later, high school student Aiko Tachibana finds that she may be the duplicate of a girl trapped within the Matter whose family disappeared in the Burst. An enigmatic fellow student Yuya Kanzaki offers to solve the mystery by taking her with a group of professional Divers to the Primary Point which was the center of the Burst. As of late, Netflix has been on a roll showcasing some unexpected, if not outright surprising anime acquisitions into its digital library. Having already perused the current catalog and that to come, the latest addition from studio Bones, A.I.C.O -Incarnation- has been one of the few sci-fi productions I have been wringing my hands to see. Of course, having no definitive expectations or prior knowledge going in, the finish project might as well be akin to watching paint dry. Gist of the series tells the story of an alternate Japan caught in a catastrophic event called “Burst” that besieged a prominent research center with “Matter”, a proliferation of cells. Aiko Tachibana, a young high school girl that lost her family in the incident, learns they might be alive thanks to information from Yuya Kanzaki, a mysterious transfer student. The catch: go to “Primary Point”, the heart of the Burst phenomenon and get her real body back, the one badly damaged in a car accident and the reason for the incident in the first place. Sounding more like a mediocre B-horror movie than anything resembling speculative fiction, A.I.C.O straddles the line between being good in presenting itself, but abysmal in riveting storytelling. One the greatest strengths and weaknesses of the series comes from how deliberately slow it is in exploring its themes. Granted that “knowledge can be a horrible thing” and “the hubris of humanity” are messages I have seen done and better than what is on display here, Aiko trying come to terms with her new-found humanity does become a saving grace for it. With all the other characters being somewhat necessarily provided for the plot and being as noticeable as a puppy missing it’s favorite chew toy, it was nice to have some semblance of drama to otherwise lifeless cast. This especially helps earlier into the fray as a majority of episodes consist of Aiko and company navigating their way to Primary Point by way of lackadaisical skirmishes with the Matter. I know that Yuya did say the journey was dangerous, but I can not help to feel that he was underselling that detail by not including including a stronger disclaimer. 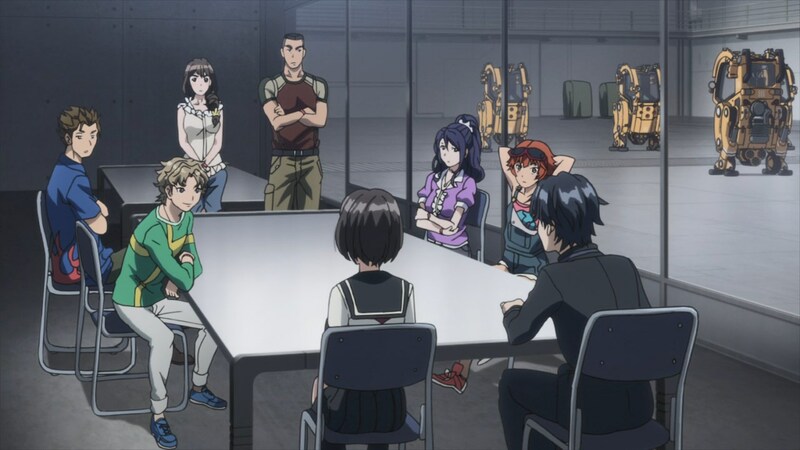 Where a majority of the 12 episode affair features Aiko, Yuya, and their hired help of Starship Troopers rejects (divers as they are called) fending off the Matter to reach Primary Point, the other side of the equation is the very equally slow, but slightly less interesting revealing events that lead to the Burst and the government moving toward enacting a plan to destroy their Matter problem. You would think they do this earlier, but hey, whatever floats your boat…or incompetent bureaucratic system. Despite failing to imbue any sense of urgency to the story just like the point of Aiko’s consciousness eroding away, the lulling moments in the story does help place a few puzzle pieces into perspective at the cost of spoon-feeding viewers information that they most likely already linked together. By the time the show reach the biggest reveals, I already had most of it figured out 5 episodes in. Disappointing as the narrative direction can be, the writing still tries it’s best at coaxing the viewers into the world, yet with reductive dialogue and mostly redundant scenes, I was more eager to wrap things up. Compared to most of studio Bones catalog, A.I.C.O is average at best. There are a few visual flourishes where they count, yet an overall standard production. The one detail in animation that did stick out and somewhat eye-catching was the facial expressions that stood out in few scenes for the wide range of emotional strain characters went through. By the same token, the soundtrack from Taro Iwashiro is none to interesting – a major step down from Arslan Senki or Suisei no Gargantia, but gets the job done. Hoping that some good would have come with Kazuya Murata at the directorial helm, A.I.C.O is just one of those productions that has a great concept but nothing backing it up. If condensed into a half-hour film…it might have more staying power, but for a largely sluggish and monotonous 12 episode affair, it drifts into the shadows of obscurity. Having heard nothing aside from curses cast upon Devilman Crybaby and the average showing from B: The Beginning, A.I.C.O fits in nicely into Netflix’s ephemeral library, but not for any meaningful reasons. Final Verdict: A.I.C.O is a sci-fi thriller that is absent on the thrills, full on the sci-fi, yet poor overall making it all blend. With all the best intentions and positive elements backing it, but missing the mark, this production is safe to pass on. Been reading your reviews for a while. Blows my mind that you don’t have more followers. Thanks. Probably my fault for being so inconsistent when I post, but not complaining if I don’t have more followers.